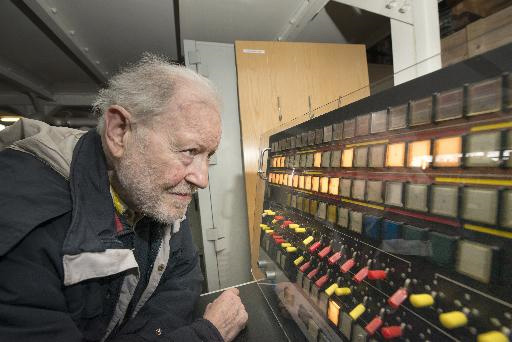 Tony Pritchett at the Atlas Computer Console. With thanks to Chilton Computing http://www.chilton-computing.org.uk/ Copyright STFC Rutherford Appleton Laboratory. It is with great regret that we have to tell you that our dear colleague Tony Pritchett died very suddenly on Monday, August 28th, 2017. Tony was a stalwart member of our management committee for nearly 15 years. He recorded and edited all our talks, never missing an event, and his good humour and lively mind made him a wonderful asset to our Association. Tony was born in 1938, and as a child had been fascinated with trains and railways, a hobby that gave him satisfaction all his life. He studied engineering, a training that encompassed a degree of physics, and he had a very wide range of interests which he pursued enthusiastically. Conversations with him were never banal, rather you found yourself discussing subjects such as the circularity of time or the potential benefits of developing cold fusion – and if sometimes your powers of understanding became rather overstretched, you were always impressed by the extent of his research and knowledge. He was widely travelled, and despite frequent bouts of ill-health during the last few years, he continued to attend conferences in faraway places. In addition to his technical expertise, Tony was artistically and imaginatively talented. In 1967, for instance, he created Britain’s first computer animated cartoon using the world’s most powerful computer, the ATLAS. His film, The Flexipede, was screened at The ICA’s landmark exhibition, ‘Cybernetic Serendipity’, in 1968, and was again shown at a retrospective of the period a couple of years ago. The analogue moving image Sidebands, which he built jointly with his friend Hugh Riddle, was also shown at this exhibition, which then toured the USA. It was the only exhibit to be bought, and it operated for 25 years in the Palace of Arts and Sciences, San Francisco. Tony went on to create more ground-breaking experimental work throughout the 1970’s, and his interest in the development of technology and science never waned. Why did our dear friend have to die? This is a moving testament to Tony, and we will indeed remember him with much affection. As an Association, we will be much the poorer without his support and input, and on a personal level we will sorely miss a clever, cheerful, kind, and loyal friend.